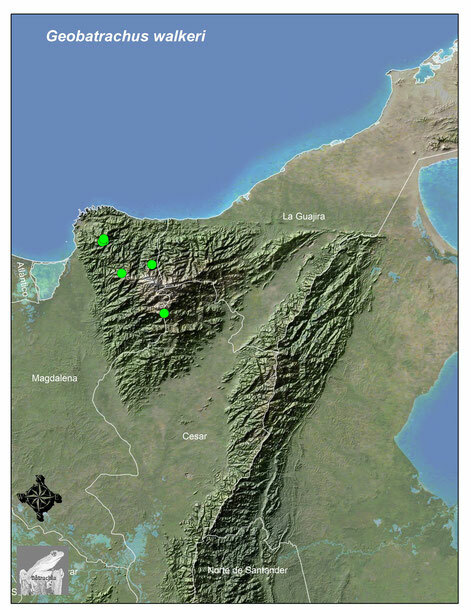 Conocida de los Bosques de niebla de la Sierra Nevada de Santa Marta en el Departamento de Magdalena (Ruthven, 1915; Ruthven, 1922;Peters,1952; Dunn, 1944; Cochran & Goin, 1970;Lynch, 1971;Ardila, 1979;Kluge, 1983; Ruiz et al. 1996; Acosta, 2000;Ardila & Acosta,2000;Stuart et al. 2008;Rueda & Vargas, 2010) entre los 1550-3500 metros sobre el nivel del mar. Categorizada por la UICN redl List como en peligro (EN). Ardila-Robayo, M.C. 1979. Status sistemático del genero Geobatrachus Ruthven 1915 (Amphibia: Anura). Caldasia. 12(59):383-495. Ardila-Robayo, M. C. & A. R. Acosta-Galvis. 2000. Anfibios. En: Rangel-Ch. J. O. 2000. Colombia: diversidad biótica III. La región de vida paramuna. Universidad Nacional de Colombia. Bogotá. Cochran, D. M., & C. J. Goin . 1970. 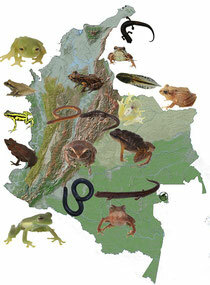 Frogs of Colombia. Bulletin of the United States National Museum 288: 1-655. Dunn E.R. 1944 Los Géneros de Anfibios y Reptiles de Colombia, 1. Primera parte: Anfibios. Caldasia, 2(10):497-529. Kaplan, M. 2003. The "pseudofirmisternal" pectoral girdle of anurans. Alytes: 77-99. Kluge, A. G. 1983. Type-specimens of amphibians in the University of Michigan Museum of Zoology. Miscellaneous Publications. Museum of Zoology, University of Michigan 166: 1-68. Lynch, J.D. 1971. Evolutionary relationships, osteology, and zoogeography of leptodactylid frogs. Miscellaneous Publications of the Natural History Museum of the University of Kansas (53):1-238. Peters, J. A. 1952. Catalogue of the type specimens in the herpetological collections of the University of Michigan Museum of Zoology. Occasional Papers of the Museum of Zoology, University of Michigan 539: 1-55. Ruthven, A. G. 1915. Description of a new tailless amphibian of the family Dendrobatidae. Occasional Papers of the Museum of Zoology, University of Michigan 20: 1-3.